A very precise map of Turkey with the all the principal and secondary road network, and all the picturesque routes clearly marked. 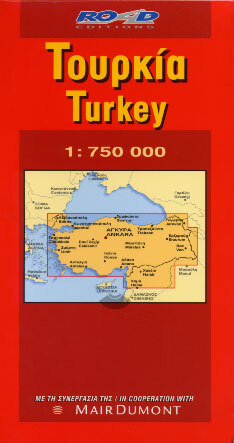 The map contains an index of the cities and distances in kilometres as well as the plans of the towns of Ankara, Istanbul, Edirne, Izmir, Kayseri, Bursa, Antalya, Adana, Van and Trabzon. Legends in German, English, French, Turkish, Italian, Polish, Dutch, Czech.